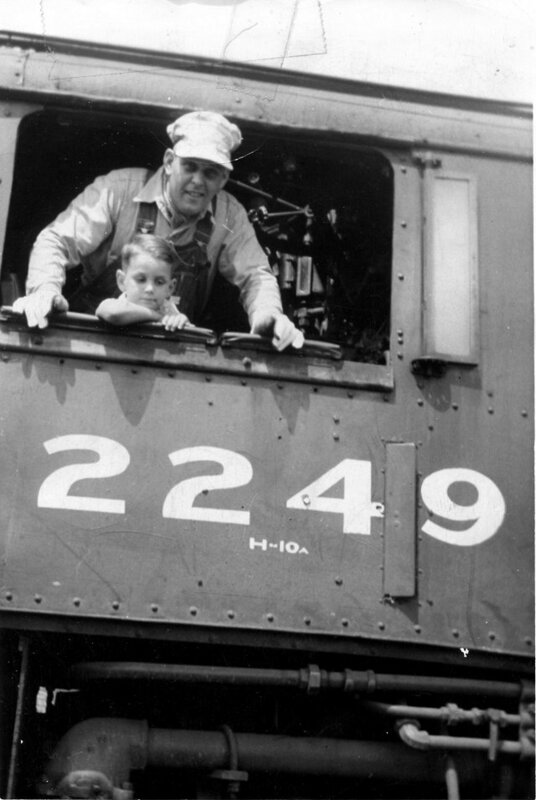 Earl L. Sharp & son Ed in 1946 at South Anderson Yard. My father worked for the New York Central Railroad as an engineer out of the South Anderson Yards from the early 1940's to 1979. (by then I think it was Conrail) Some of the old timers might remember him. His name was Earl L Sharp (I think his nickname was “the turtle”). His dad was EE Sharp, and his uncle was Harry Sharp, both of whom worked out of the South Anderson yards as engineers. Many of the names spoken of on the Rail-fan page are familiar to me, and I can think of several others. In 1979, when dad went for his routine RR physical, it was found his blood pressure was too high and he was pulled out of service. If memory serves me, he had been working second trick yard job at the time. As the next several years passed, his health did not improve. He had a stroke in early 1984 and became an invalid. In April or May of 1987 he was diagnosed with terminal lung cancer. My family and I lived in Monticello, IN which is about a 2 hour drive from Anderson. I worked in West Lafayette, IN. We typically traveled to Anderson by going toward Kokomo, then south on US 31 to Westfield, then east to Anderson. Those readers who are familiar with the roads in the area know of the rail crossing on US 31 south of Kokomo and North of the Tipton area. It is double track that runs east and west. On June 1, 1987, dad was in Community Hospital in Anderson, and I received the call no family member wants to hear. We should gather together as the end was near. I called my wife and daughter in Monticello and gave them the news. I drove from West Lafayette to Monticello. We all made a rather hasty departure for Anderson. My wife and I were in one car, and my daughter and son in law were in another as we hurriedly convoyed south. We had been making this same trip at least once a month for over 16 years and had never been stopped by a train on the US 31 crossing. On this day, as we approached, the flashers lit up and the gates came down. This day we would have to wait on a train. It was a fairly short train heading west at fairly high speed with 2 white extra flags displayed on the lead unit. I looked at my watch, it was 3:15pm. As the train passed and the gates came up, I told my wife that I didn't think we needed to hurry now. When we got to Community hospital, dad had already expired and the next few days were taken up with usual sadness of a loved one's passing. When things settled down a little bit, I finally had time to review dad's death certificate for cause of death, etc. As I read through the document, one thing leaped out at me: time of death 3:12pm. The precise time we were stopping for the west bound extra. I am neither superstitious or religious, but sometimes in this life there are unexplainable events that cause one to pause and reflect.